Filtermist International is growing. The world’s leading manufacturer of Mist Collectors recently marked the opening of its brand new global headquarters in Telford, England. The celebration was attended by more than 30 of the company’s global distributors, including AMT Machine Tools from Canada. Filtermist was launched in Bridgnorth, England in 1969 to provide reliable and efficient oil mist removal solutions. Over the past 40+ years, the company’s Mist Collectors have grown in popularity, and are now sold into more than 60 countries worldwide making the move to a larger facility necessary, as the industry leader continues to grow its market share. AMT Machine Tools Ltd. has represented Filtermist Mist Collectors in Canada for more than 35 years, and was on hand to celebrate the opening of the new facility. The Toronto-based company carries an extensive inventory of Filtermist Mist Oil Mist Collectors and accessories, and its knowledgeable staff is always available to assist with installation and capacity recommendations. 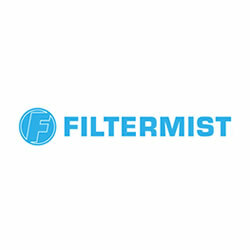 Metalworking shops worldwide make Filtermist the number one choice in Mist Collectors. The compact, quiet units efficiently remove oil and coolant mist, fumes, smoke and steam to help create safer environments at manufacturing plants across the globe. The units help thousands of customers comply with local health and safety guidelines by reducing the amount of airborne pollutants. Filtermist Mist Collectors are available in capacities ranging from 295 up to 1,400 CFM. They can be mounted directly on top or on the side of machines, on a floor stand, or suspended from a factory ceiling. Filtermist mist collectors help manufacturing businesses comply with local health and safety guidelines by reducing the amount of airborne pollutants. In some countries the penalties for being in breach of these guidelines can be severe with heavy fines for the business and individuals responsible within the company. It is important to keep a healthy workforce to reduce down time and sickness which negatively affect the productivity of the business and Filtermist mist collectors help to achieve this. Filtermist Oil Mist Collector units efficiently remove oil mist, coolant mist, fume, smoke and steam in thousands of manufacturing operations around the world. In addition to being used extensively by the Metalworking Industry, Filtermist oil mist collectors are also used on applications including; spark eroding; grinding; food spraying and industrial washing processes. There are currently over 200,000 Filtermist units operating in over 60 countries worldwide, making Filtermist the world’s leading mist collector. 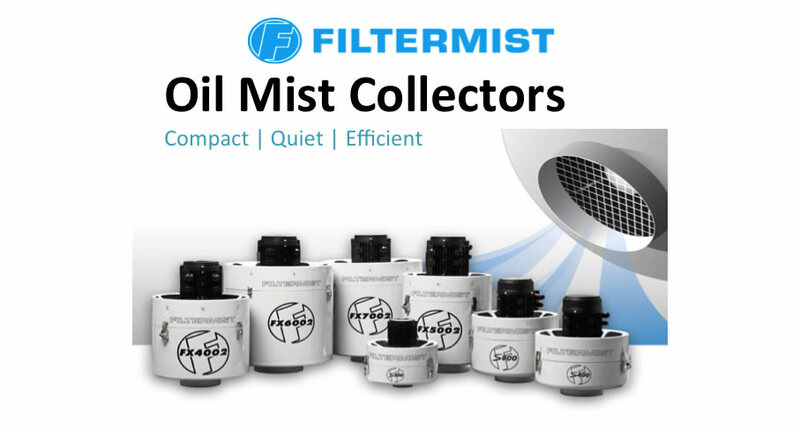 Filtermist Oil Mist Collectors are available in capacities ranging from 295 – 1400 CFM and they can be mounted in a variety of ways including; directly on top or on the side of machines, on a floor stand, or suspended from a factory ceiling. Using Filtermist to eliminate oil mist and smoke from your plant will not only result in a cleaner, safer environment but can also result in increased productivity.